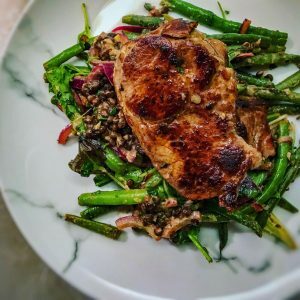 My hubby is a huge fan of lamb in any dish he can get his hands on so I’m always keen to come up with new ways to incorporate the meat into our weekly meal plan. Last week, I decided to mix things up a little and prepare this warm wintery salad so that we could indulge in a bit of lamb steak, without going too heavy on the points and the result was delicious. The warm salad is fresh with herbs and filling because of the lentils and the tahini dressing give the whole dish a lovely houmousy flavour that goes so well with the lamb. Best of all, it’s extremely quick and easy to prepare. I served the dish with a small packet of green beans per person (as this forms the main base of the dish) however if you wanted to add a flat bread or even some roasties (remember to add the extra points), you could just use the one packet of green beans between two. If you aren’t a huge fan of lamb, this dish would work equally as well with lean rump steak (you can have up to 175g of raw lean rump steak for the same amount of points). Start by making the dressing. To a small bowl add the tahini, garlic, zest of 1 lemon, olive oil and chilli sauce. Mix with a splash of warm water until you have a loose ‘dressing’ consistency. Pop the dressing to one side. Next, par boil the green beans in salted water for 3-4 minutes. Drain and then place into a hot frying pan with the red onion. Spray both with 1kal and fry for 3-4 minutes until the beans start to char and take on some colour. Pop the beans and red onion into a large bowl. Warm the cooked puy lentils through in the microwave according to the packet instructions (I warmed for 45 seconds) and then add to the bowl with the green beans and onion. Next add the parsley, mint and rocket to the bowl. Add the dressing, season with salt and pepper and then toss everything together so the dressing coats the contents of the bowl nicely. Finish with a squeeze of lemon juice (I used a quarter of the lemon) and then pop the bowl to one side to rest. Spray a hot frying pan with salt and pepper, Season the lamb steaks with salt and pepper and add to a hot frying pan. Fry for 2-3 minutes on one side, turn and fry for another 2-3 minutes on the other side for medium rare. If you like the lamb more well done add 1-2 minutes per side. Pop the green beans/lentil mix into the centre of a plate and top with the lamb steak. Serve with a slice of lemon and a flat break if you fancy bulking the meal up a little more (remember to add the extra points). Hi Emma, is the recipe correct saying 2 x 70g lamb steaks? That seems awfully small.